One of the most common questions I'm asked about my identical twins is, "Isn't it amazing that they have such different personalities?" People who only know the science behind twins, but have never truly known identical twins, are the ones who ask this question. My snarky Mama response wants to be, "NO, they are two different people so of course they are different!" But that is unhelpful. I know them, and see identical twins everyday. Identical twins are rare, so they are a mystery too many. Maybe you've grown up hearing stories (or seen movies) of identical twins who know when the other is wounded from 1,000 of miles away. I can then see how this adds mystery and confusion. You think they are just clones of the same person. Twins are not clones. 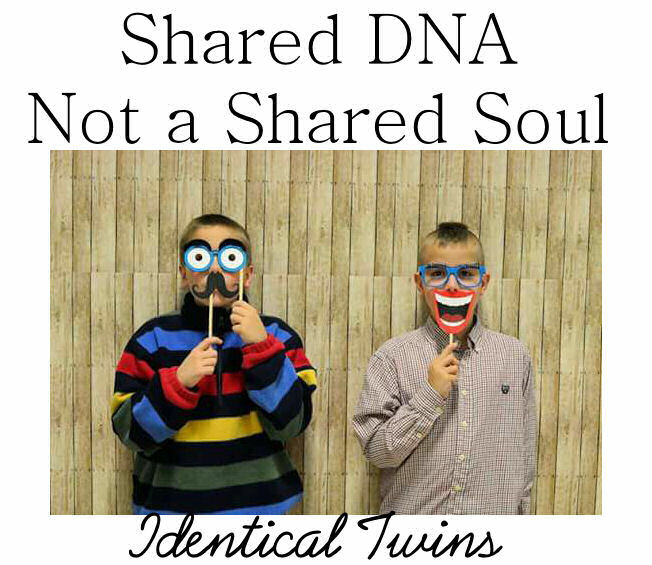 Twins are physically, and spiritually linked, just as you and your siblings are connected, but are not the same person. Identical twins get the added bonus of spending their entire lives together, going through the same stages together. I am a twin (I have a fraternal twin brother), but my identical twins have a special bond I will never truly understand. But this bond is not make them the same person. 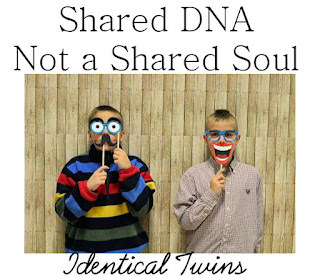 Identical twins share DNA, they do not share a soul. Yes, identical twins are one egg split in half. The science is quite fascinating. But here is the most important & ineffable aspect of twins, they are not a soul split in half. I believe our God is sovereign and powerful enough to create two identical bodies with two different souls. He knit their hearts and minds together in my womb, each of them...separately. One twin is not an accident or afterthought once the first one was knit. He knew them both separately, before their zygote split. He uniquely gifted them with their own talents, souls, and spiritual gifts. I see this as a similar miracle to when God took my mother and father's DNA and miraculously made different combinations of different people between me and my siblings. I am no scientist, and I may be wrong in how I view this, but I have watched my two boys for ten+ years now. 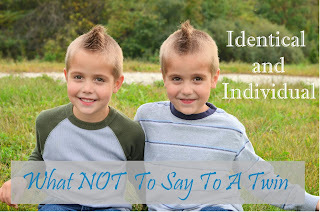 I have witnessed two children, who technically are suppose to be the "same person'" according to their DNA, born as two unique and different people. As they grew, they have different personalities. They are quite similar in many ways, which is to be expected of course. But they are not the exactly the same, and they are not opposites. They are uniquely themselves. They are each who God knit them to be. So I will amend my snarky answer with, "Yes, it is amazing that they have two different personalities, because the God who made them is Amazing."